Barnes and Noble has released their first tablet of 2016 and it is another Samsung branded product. 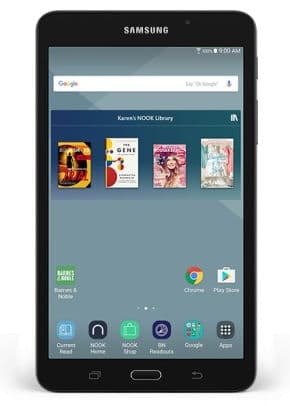 The new Samsung Galaxy Tab A NOOK is available today in every single one of the companies bookstores and online for $139.99, but if you trade in your old device you can get it for a paltry $99.99. The new tablet features a 7 inch display with a resolution of 1280 x 800 and 216 PPI. This is an entry level tablet, certainly not meant to compete with flagship devices on the market, such as the iPad or Surface. Underneath the hood is a Qualcomm MSM8916 Snapdragon 410 1.3 GHZ quad core processor and 1.5 GB of RAM. There is 8 GB of internal storage and there is SD Card support for up to 256 GB. You will be able to access the Samsung App Store and Google Play on this device and it is running Android 5.1.1, which is fairly dated by late 2016 standards. This tablet also has a slew of customized Nook Android Apps, such as an e-reading app, library management, magazine reader and more. Do you intend on purchasing this tablet? The price is right and if you have any problems with it, you can simply visit your nearest Barnes and Noble bookstore to get direct support. Same price as the Samsung branded Tab A on Amazon. There’s no real reason to buy it from B&N — barring a trade-in, I suppose — is there? To answer your question, no, 8GB is way too small; leaving less than 5GB to install programs … even if you install to an SDCard, some of that installation has to go to the device storage (it’s the way Android works) and that 8GB will fill up quickly. The tab is same as the Samsung galaxy J max that was released in India just this month for roughly $200-206. The tablet is kinda OK, but don’t expect it to be upgraded to Marshmallow. If u are in for a Samsung tablet buy the galaxy tab A instead if u can afford it.